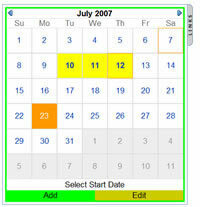 Dreamweaver Link Calendar allows you to insert a calendar on your web pages and from a visual interface to link dates to web pages. The links can be opened in a in the same window or in a new window. Important note: With this extension you can associate "links" to the dates. If you want to associate mouseover information instead direct links we have another extension for that purpose, our Dreamweaver Visual Calendar. Note that these calendar extensions are different products. Note: This extension is designed for servers with support for PHP scripts. If what you are looking for is an ASP based calendar then use our ASP Dreamweaver Link Calendar. You can easily and securely edit the calendar from a 100% visual interface, without any need for programming or HTML skills. Please check this video demo for a quick introduction on how to manage the calendar. For your convenience, we have also provided an Administration Demo; you can try using the calendar yourself and see how easy it is. Note: To see the administration changes applied into the "public" calendar above you must refresh this page. Note: You can have as many calendars as you wish within one website. It's necessary to set writing permissions to the folder "TDE_LinkCalendar/admin/database" where the data will be saved to. You can consult our FAQ if you are not sure how to proceed. Note: This software does not require any external database system. All the data are saved in text files on the server, which makes the requirements minimal and facilitates installation. You will find details below in "Development Notes". Please, check this animated demo to see exactly how you can use this extension. Additional Info: Dreamweaver Link Calendar - Online FAQ. Insert the calendar from the menu "Dreamweaver Menu >> Commands >> Insert Link Calendar"
On your web server, set writing permission for the folder "TDE_LinkCalendar/admin/database", including permissions to the files inside it. For visual information, please check this video demo. 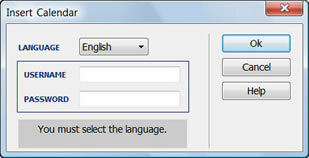 LANGUAGE: To select the calendar's language. Currently available: English, Spanish, French, Italian, German, Japanese, Portuguese and Dutch. USERNAME: To create an username to access the calendar admin. PASSWORD: To create a password to access the calendar admin. You can create a different username and password for each calendar inserted in your website. Keep in mind that you have to set writing permission for the folder "TDE_LinkCalendar/admin/database" and to the files inside it. To know more details about how to set writing permission please read the related entry in our FAQ. Also, you may normally contact your hosting provider in order to find out how to set writing permission on your server. 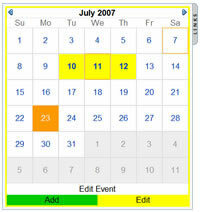 Inserting a Link: put the calendar in "ADD" mode (see a button under the calendar). Click on the first day of the date range to select and afterwards on the final day of the range; if you refer to just one day then click twice on the same day. At the second click, a window will show up to add the link to be associated with the selected dates and the destination (target), for example to open the link in the same window or in a new window. Finally, simply click on "Save". Changing a Link: Put the calendar in the "EDIT" mode. Click on the date you wish to edit and a window will show up to edit the associated link and target. Removing a link: With the calendar in "EDIT" mode, once you select a date with an associated link, a Delete button will also appear allowing to remove the link. To see the result, use your browser to open the page with the public calendar that can be seen by your website users ? that is, the page where you initially inserted it.